This post was made possible by Shapr through compensation. The actual contents and opinions are the sole views of the author, who maintains editorial independence, even when a post is sponsored. For more details, please read our disclaimer. How do you position yourself to discover hidden jobs and other opportunities before the rest of the herd? The answer is networking. It’s the most powerful tool you have in your career planning kit. Networking opens doors to people, places, alliances, and information that you didn’t even know existed. 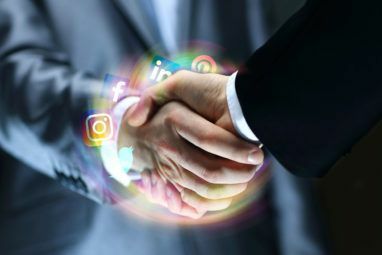 While most people use LinkedIn to build a profile and manage connections, it’s quite complicated and takes time to develop contacts. Shapr provides you with a better way to network and collaborate with like-minded individuals. Let’s take a look at Shapr and features it offers to make professional networking easier. 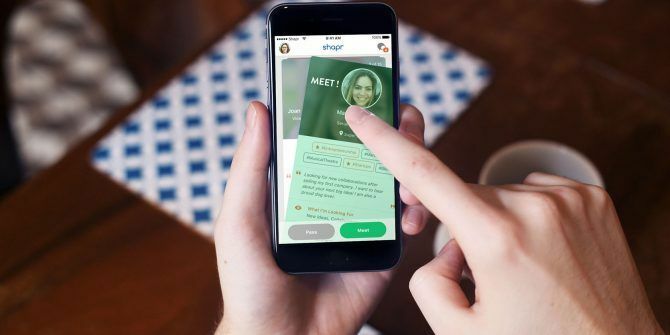 Shapr is a personalized professional networking app. It uses algorithms and machine learning to suggest profiles of users with similar interests and professional goals to your own. 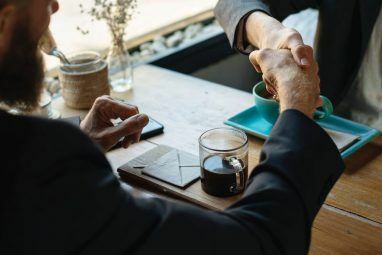 Whether you’re seeking investors for your startup idea, looking to grow your network, or want to make new friends for long-term networking, Shapr makes it easy to meet professionals who are interested in the same goals. The signup process for Shapr is easy. To get started, you can log in with your LinkedIn account to pull relevant data. If you’d rather, you can also sign up with an email address. Your identity is like a brand in terms of what people think of you. Therefore, it’s important to get the essential details right here. Type in your real name and upload a recognizable photo of yourself from your computer. Next, enter the name of your company and your job title. The title should be to the point; don’t enter your entire job description. This information will sit right at the top of your profile. Shapr uses location data to help you connect with people near you. 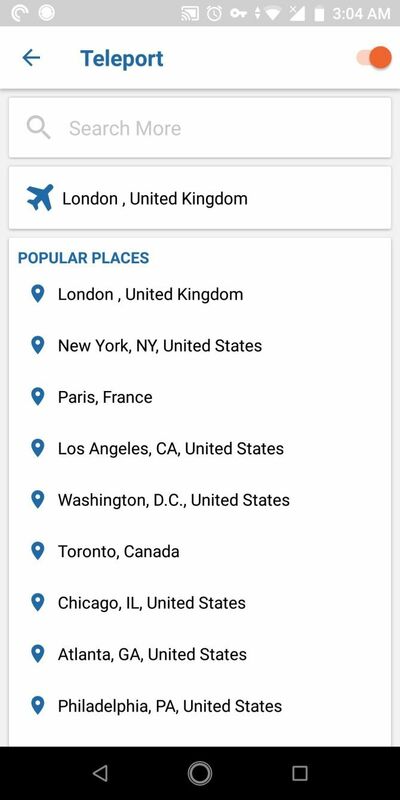 As you enter a city name, you can select it from a dropdown list of locations. If you live in a town close to a major city, choose that city for best results. A comprehensive networking strategy is highly dependent on goals; therefore you must prioritize them. Shapr organizes these goals into categories. Opportunity-centered goals revolve around what you want to achieve from a particular circumstance. They include making new friends, getting inspired, exploring a career change, and more. Short-term and long-term goals may include finding investors, growing your business, hiring employees, and more. Shapr gives you the chance to choose just three goals. So before you select them, think about your career and desired timeline to achieve your goals. 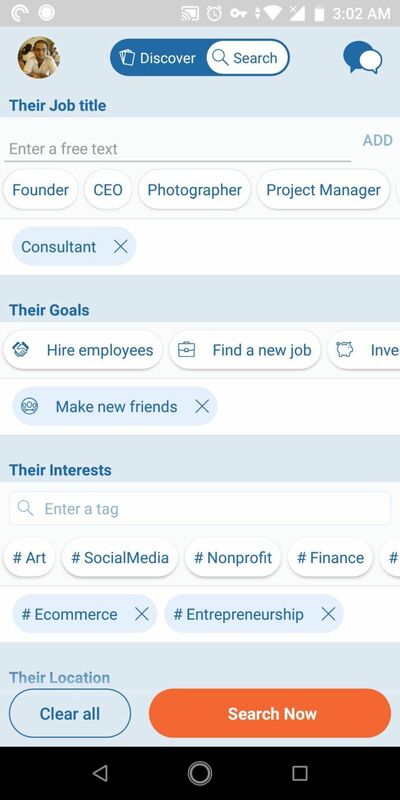 The Interests area of your Shapr profile is how you connect with people of similar interests, skills, and passions. The interests you choose should reflect some common characteristics and how you want to be perceived by your target audience. For example, if you work in the education sector, sub-interests could be digital learning, knowledge management, teaching, and so on. Shapr lets you add up to 12 slots for your interests and automatically suggests sub-interests. Based on your goals and interests selections, Shapr shows you relevant profiles that might interest you. Think of your Shapr bio as the objective section of your goals. In just 250 words, you should give people a clear idea of who you are, what sets you apart, and what you’re expecting from other people. Since your bio is one of the first parts of your profile people will read, write one that convinces others to connect with you. It should sum up your value proposition for the outcome you’re hoping to achieve. After completing the above steps, you’re all set to start using Shapr. 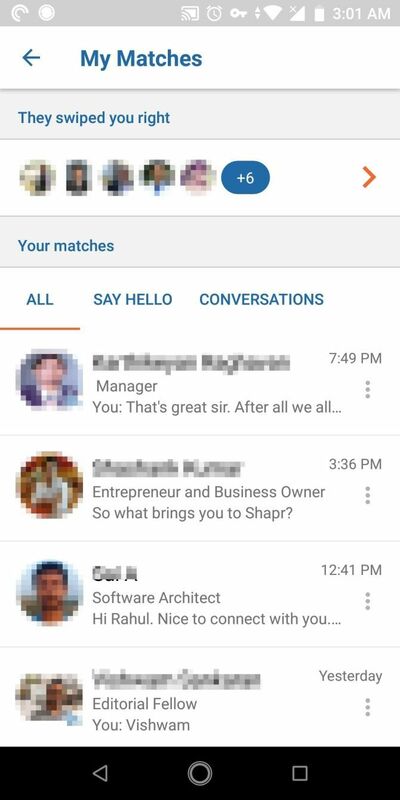 Along with the web version, Shapr offers a mobile app for both Android and iOS. Once you install them, log in to your Shapr account and start networking with people living nearby. Shapr sorts user profiles into suggestions based on goals, location, and tagged interests. Every day, Shapr produces a personalized selection of 10-15 potential opportunities for you. If you see a profile that interests you, swipe right. Swipe left if you’d prefer to pass on that profile. All interactions are anonymous, so people won’t know whether you’ve swiped them right or left. Once the interest is mutual, you’ll get an email or push notification. You can then start your conversation through private messages. However, note that if you swipe right on everyone, your account might get flagged. Thus, you should be discerning with your swipes. 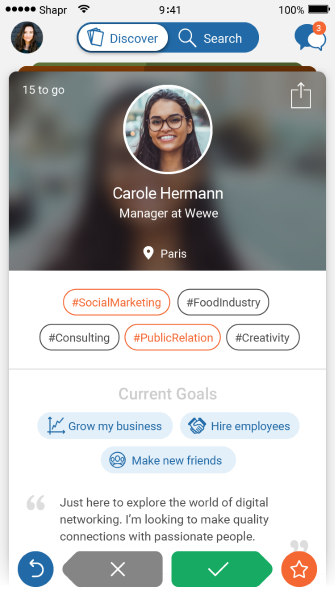 With Shapr Pro, you get twice the number of profiles to swipe through in Discover mode. You can also rewind your last left swipe using the blue button in the bottom-left in case of a mistake. See below for more details on Pro. 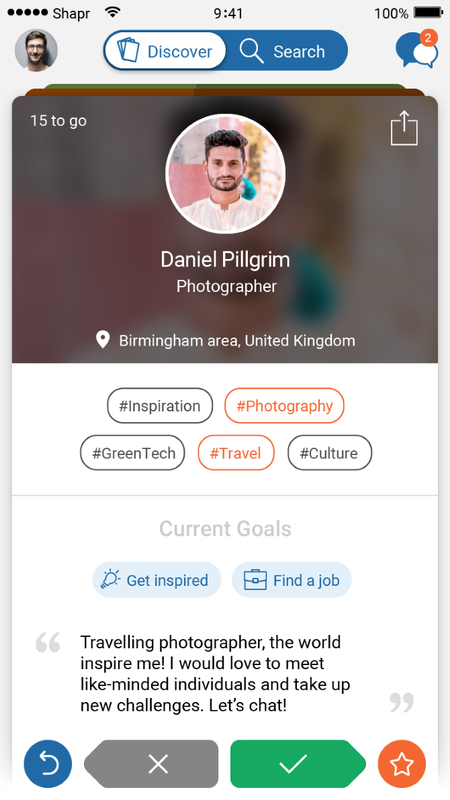 In Search mode, you can set your own criteria for the type of professionals you’d like to meet. This includes Job Title, Goals, Interests, and Location. Each category acts a filter and lets you add up to three items. For instance, if you enter “consultant” for Job Title, “entrepreneurship” under Interests, and “New York” for Location, your results will include consultants in New York with a passion for entrepreneurship. With Shapr Pro, you have the option to see profiles from any location you choose. The remote city you pick will show up on your profile instead of your current region. You’ll then be presented with profiles to swipe from that location. 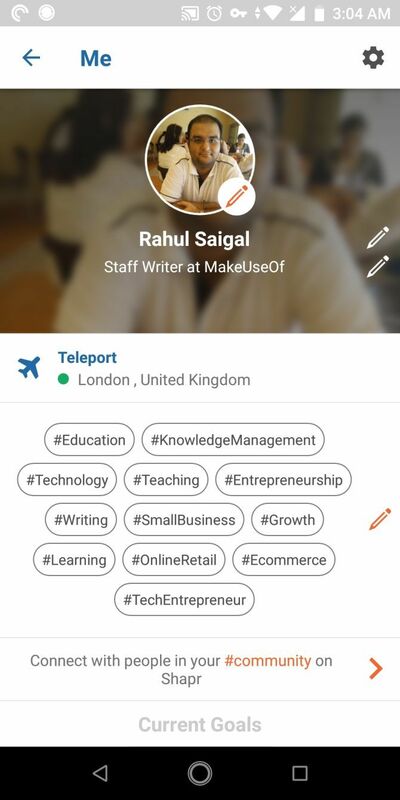 If you’re planning a trip, want to switch jobs, or perhaps want to get advice from professionals in another country, the teleport feature is extremely handy. What Do You Get With Shapr Pro? To upgrade your account to a premium subscription, open the Shapr app and choose the plan that best suits you. You can save money by subscribing for a longer period of time at once. The challenge of networking is that most people don’t exactly understand what it means, nor how to start. Some people think networking is a finite action that takes place at an event or conference. The truth is that networking is not a one-time deal, but a lifelong activity. Shapr helps you to achieve your goals and develop connections easily. 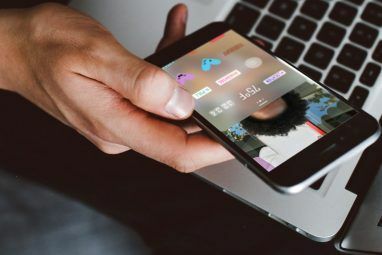 The app is simple to use, and within a short time, you’ll start making connections. And if you like the basics, the Pro subscription can take you even further. Go ahead and sign up for a Shapr account now and give your professional life the boost it deserves.